Going on a mini vacation this past weekend really put a damper on my WIPs this week. I managed to finish my Easter animals, but then I picked up a special project. I'm testing out a pattern for Adrialys Designs :) I was kind of ridiculously excited to be asked to test, especially because I've never gotten to do it before! Here's just a little sneak peak for you - I have to say I love the way you do the shaping and I think it's a super cute design. I can't wait to finish it! I've also been listening to the audio book of The Devil In The White City by Erik Larson. It's about one of America's first documented urban serial killers who preyed on visitors to the Columbia World Exhibition in 1892/1893. I was excited to read this book when I learned about it, but I'm currently almost halfway through and it's ... kind of boring me to be honest. I never would have thought that since I have a weird interest in serial killers in general. It's more the writing style - it's like every paragraph is designed to be read by a newscaster off a teleprompter. I understand it's hard to create a 1st person narrative more than 100 years after the occurrence, but you can totally tell that all of the info in the book was gained from old letters. The things you would want to learn more about are mostly speculative, and the things you wouldn't really care much for are described in crazy detail. I swear if I have to hear how someone's "striking blue eyes stood out from the drab Chicago background" one more time, I may just not finish the book, lol. As bad as it sounds, I hope that once the killing begin the story picks up. We shall see. 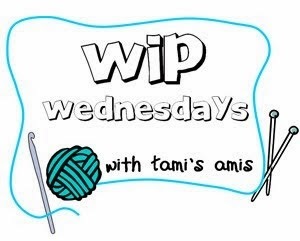 That's all I've had going on this week :) Head over to Tami's Amis' Blog to see what others are making too! Love your little bug and congrats on being asked to test it. I will have to look for that book, it sounds pretty interesting! Found you from Tami's Amis! My husband read Devil in the White City - I bet it is great as an audible read! In Indiana the advanced English classes read all the gory, horrific, real life crime stories. Both of my girls hate the books they have to read. I am not sure just which twisted, sick mind is in charge of choosing the books. That one is on my Nook since the youngest had to read it for her Sophomore AP English. I haven't tried it yet. She hated it.